To be in the presence of a real person who made calendars and almanacs was to Renka a revelation. She could easily imagine such things being printed. But the creation of the calendars was well beyond her grasp. It had never occurred to her that somebody actually made them every year. 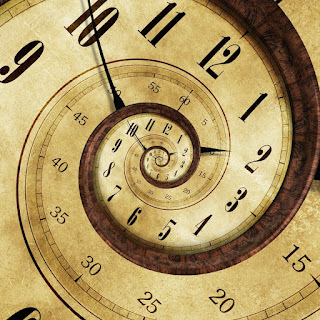 Frankly, it's still a mystery where time comes from, though we have learned how to measure it with great accuracy. The creation of accurate calendars was key to the scientific revolution. Commissioned to create a better calendar, Copernicus ended up rejecting the Ptolemaic model of the solar system in favor of the heliocentric, which Galileo then confirmed with his observations of Jupiter and its moons. Galileo also created the first pendulum clock. The invention of precision chronometers is documented in Longitude, Dava Sobel's fascinating biography of the 18th century clockmaker John Harrison. If I want to know the time, I glance at the bottom right of my screen. If I want to know when Daylight Saving Time kicks in, I google it. It's all thanks to the National Institute of Standards and Technology, the keeper of the atomic clock. Yes, somebody is in charge of time. Good thing, too. Though I wish the people in charge of time would get rid of Daylight Saving Time. Alas, that'd take an act of Congress.